Until this book was originally published in 1996 there had been little detailed research concerning the geographic location of the poor in America. 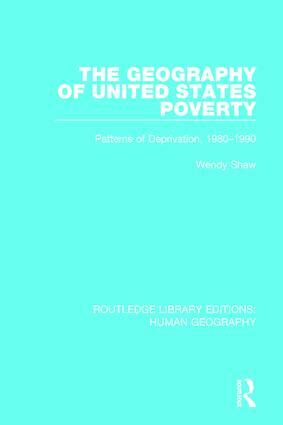 The book examines the spatial distribution of the poor within the US and discusses the general characteristics of the poverty population. It explores the complex web of theory pertaining to poverty, presenting different categories: no fault theories, individual responsibility theories, societal responsibility theories, governemntal and institutional responsibility theories, and responsibility of the economic system theories. Information on poverty from the 1980s and 90s in the US is provided, as well as historical background. The problems and complexities associated with defining and measuring poverty are also discussed.